Is the Google Pixelbook worth its $999 price tag? The answer is yes. You will not find another Chromebook out there right now that can run Chrome OS and Android apps as efficiently. Both platforms fly on this device and I’m using the base model. I can’t imagine what the i7 model’s performance is on running things. 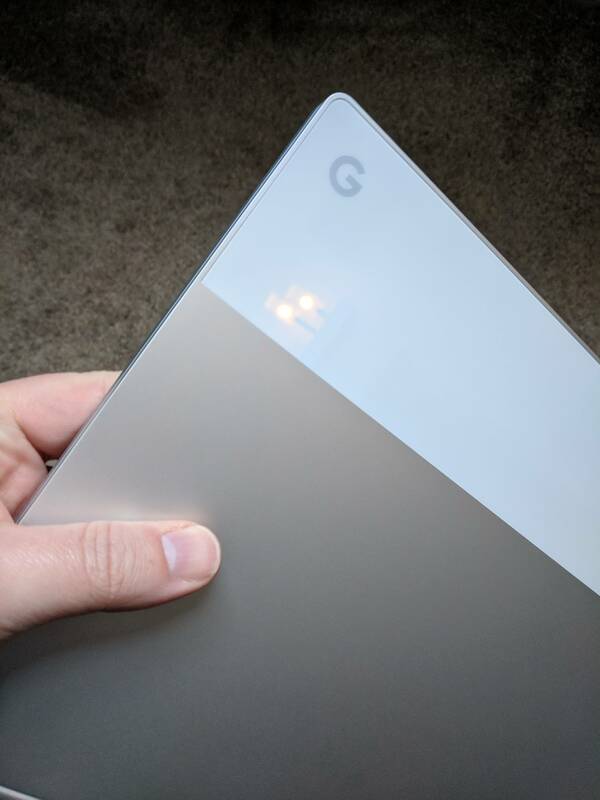 The Pixelbook chassis is comprised of an aluminum chassis with a glass detail made of Gorilla Glass on the top lid. That glass detail gives the Pixelbook a striking resemblance to the Pixel XL phone. It measures 11.4 x 8.7 x 0.4 inches in physical size or 290.4 x 220.8 x 10.3 mm in new money. It is an exceedingly thin design that makes it easy to carry around. The weight of 2.4 lb (1.1 kg) also makes the Pixelbook very portable. Internally, you have a 7th generation Intel iCore i5 or i7 processor with either 8GB or 16GB of storage. On the i5 models, you have 128GB or 256GB of storage with 8GB of RAM while the ultra-premium i7 model sports 16GB of RAM and 512GB of storage. For this review, I received the base model which is the i5-7Y57 (dual-core, 4MB cache, up to 3.3GHz) coupled with the Intel HD Graphics 615 GPU. It has 8GB ofLPDDR3 (1,866MHz) RAM and 128GB SSD (eMMC) for storage. Frankly, I can’t see any reason why you would need more storage or RAM but to each their own. Display wise, the Google Pixelbook comes with a 12.3″ Quad HD LCD display that renders at 2400×1600. That makes it a 3:2 aspect ratio that gives you a very comfortable 235 ppi for easy long time viewing of the screen. It has a wide range of viewing angles to make it easy to view and is a very bright 400 nits. It has multi-touch touchscreen support and has pen support with the Pixelbook Pen which, sadly, is sold separately. Connectivity is provided with an 802.11 a/b/g/n/ac antenna array which is 2×2 (MIMO), and supports dual-band (2.4 GHz, 5.0 GHz). Bluetooth 4.2 is also built into the Pixelbook. 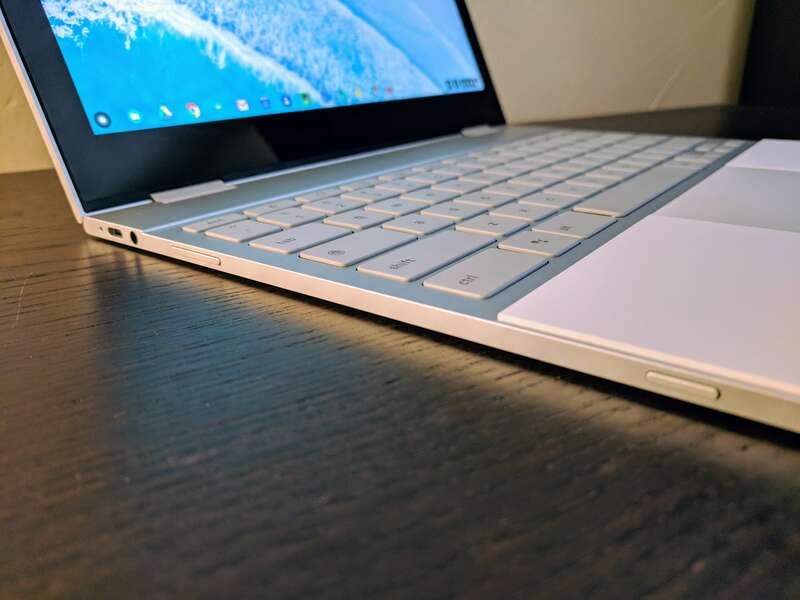 Like any ultra thin notebook and particularly for 2017 Chromebooks, the Pixelbook keeps the ports to a minimum. 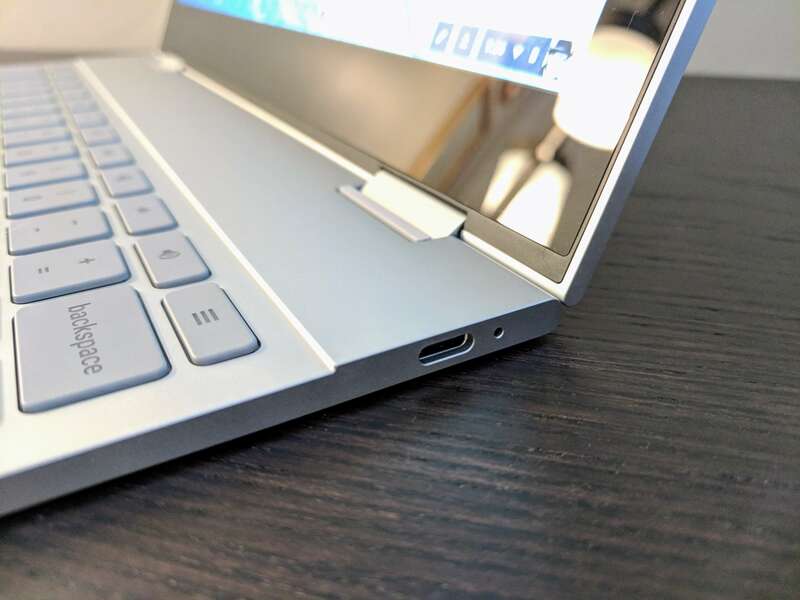 On the left edge of the base you will find a USB 3.1 Type-C connector along with the power button, volume rocker and the 3.5mm headphone jack. On the right, you will find a single USB-C port. Charging of the Google Pixelbook can happen through either port which is handy depending on your workspace configuration. 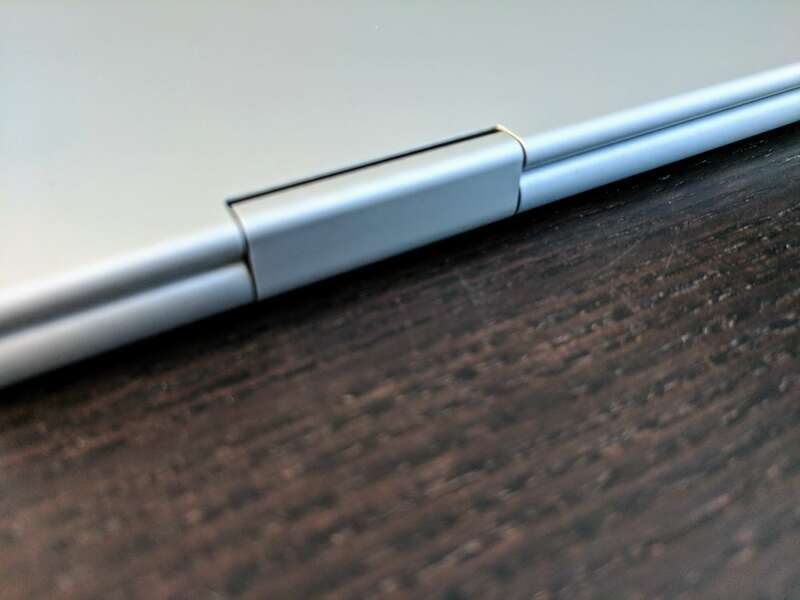 Mating the display and the base are two well designed aluminum 360° hinges that allow you to get into the different modalities of the Pixelbook. Those different modes are Laptop, Tablet, Tent and Viewing. I’ll cover them more in detail later in the review but the quality of the hinges is excellent. They do not feel too lose or too tight so you don’t feel like it is going to fall over or fall back when you are using it in the different modes. From an audio perspective, you have two speakers that are mounted under the keyboard area of the base. The provide reasonably good sound quality but could be a little disappointing for those spending this amount on a device. There are four microphones built into the Pixelbook. That is important given that deep integration of Google Assistant into the device. You will likely find yourself speaking to it more than any other laptop you have had previously and Google wants to make sure it is solid experience (it is). The keyboard is a full size QWERTY model with a scissor-cut style key mechanism and a 9mm stroke. It gives solid tactile feedback and is backlit for low light situations. 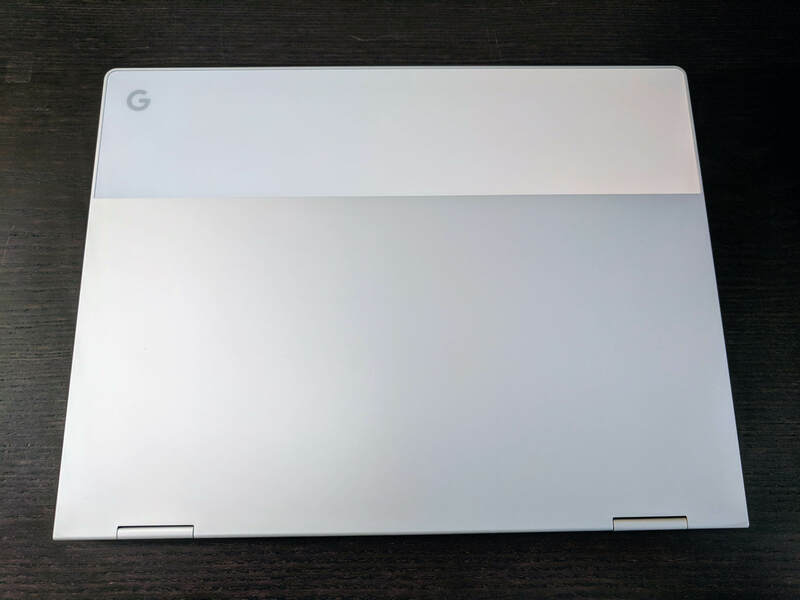 Overall, the entire package of the Google Pixelbook is outstanding. It has all of the features you would expect from this level of a laptop and the glass-on-aluminum chassis looks stunning. The Quad-HD display of the Pixelbook is amazingly sharp with rich color saturation that is a bit on the cool side. It pumps out an impressive 400 nits which makes the screen bright and gives excellent color accuracy. It easily outpaces the Samsung Chromebook Pro in this regard, which renders 376 nits. Overall, I’ve been very pleased with the display in general use as well as view photos from my Google Photos library and watching streaming movies. As for the touchscreen, it too performs exceptionally well. 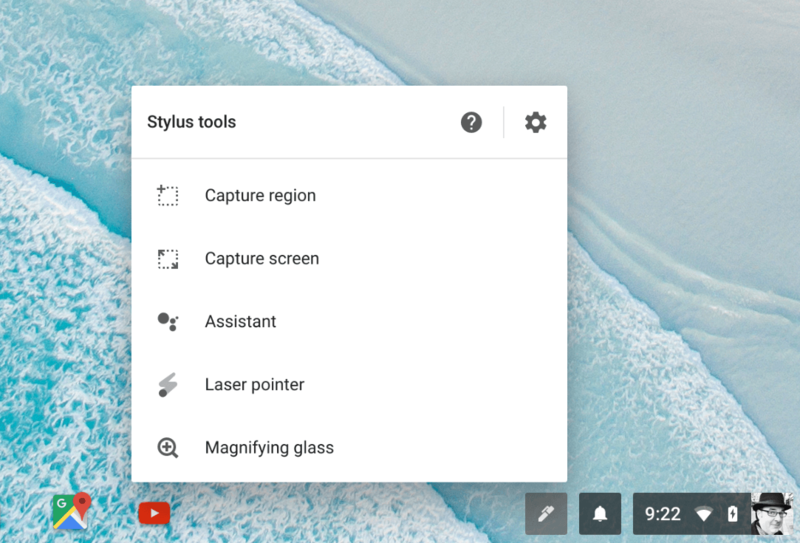 It is a multi-touch system and while there aren’t many applications for that in Chrome OS or Android, the side benefit is that the touch points are very accurate. Be it using the Pixelbook Pen or tapping things with my finger, I’ve found the digitizer to be spot-on accurate. If there has been a somewhat consistent complaint about Chromebooks, it has been the keyboard and touchpad. On the keyboard, it generally comes down to two complaints: Backlight or lack there of, and keystroke depth. Both of these are sorted wonderfully with the Pixelbook – somewhat as you would expect. The keyboard itself is full sized so it feels very comfortable to use for long periods of time. 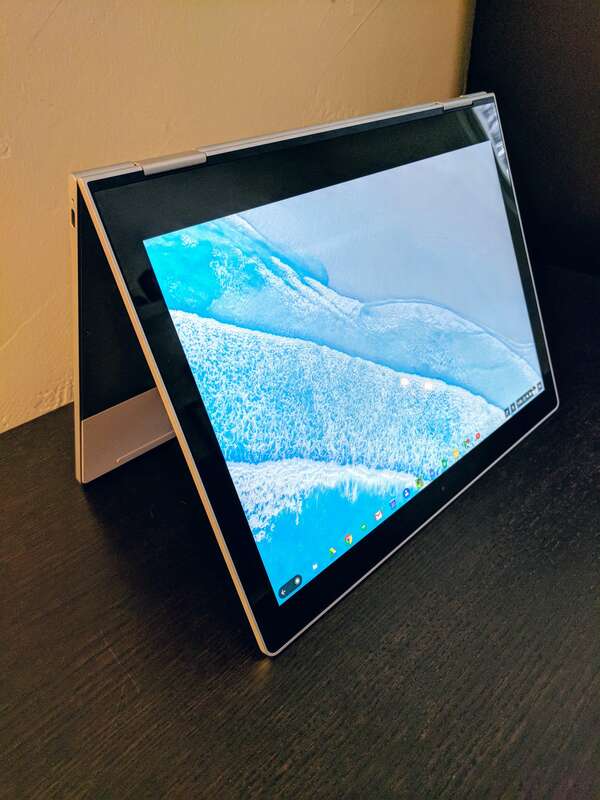 The vast majority of this review, and pretty much everything you have read on ClintonFitch.com in February, has been written on the Pixelbook. I can comfortably write 5,000 to 10,000 words a day on the site and other writing I do without any issues at the end of the day like soreness in my wrists. Part of that is down to the soft silicone wrist rests that are built into the device. They certainly add a comfort level, but it also comes down to the spacing of the keys and the keystroke depth. 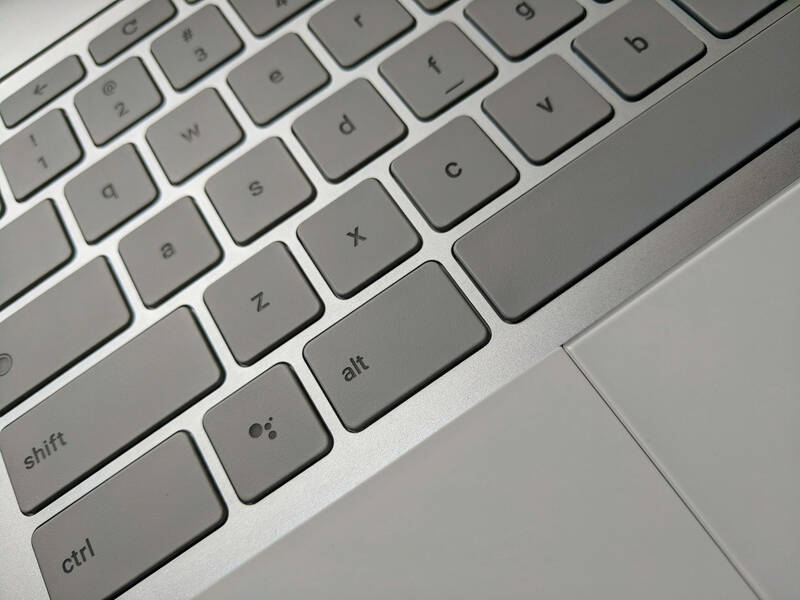 The keyboard has a scissor-cut style mechanism under each key with a 9mm stroke. That is a responsive, comfortable stroke that lets you know when you have made a keystroke. The backlight on the keyboard is also excellent in its own right. 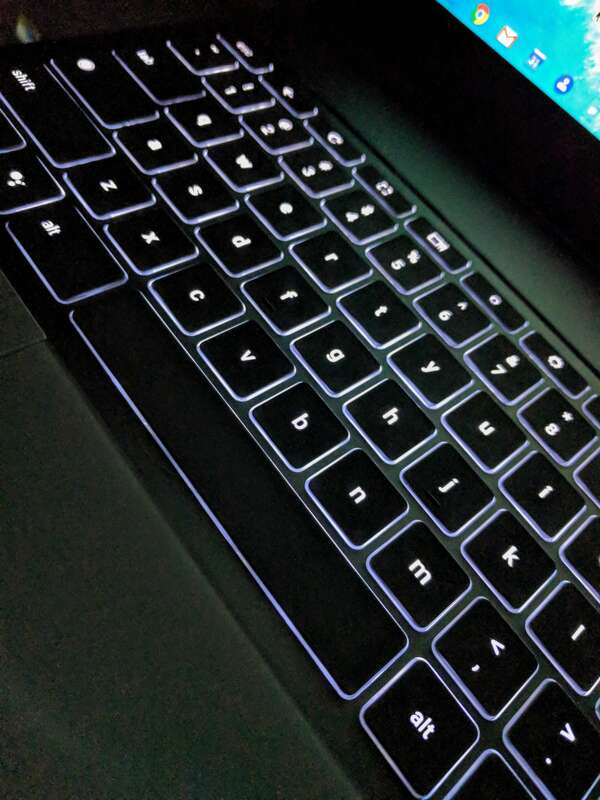 The lighting distribution is even across the entire keyboard and is very reminiscent, to me at least, of my MacBook Pro. Indeed, I would say that the distribution of the lighting is slightly better than that of the Macbook. All of this adds up to a great overall keyboard experience that gives the Pixelbook the premium feel that you would expect. That premium feel also translates to the comfortably sized trackpad. 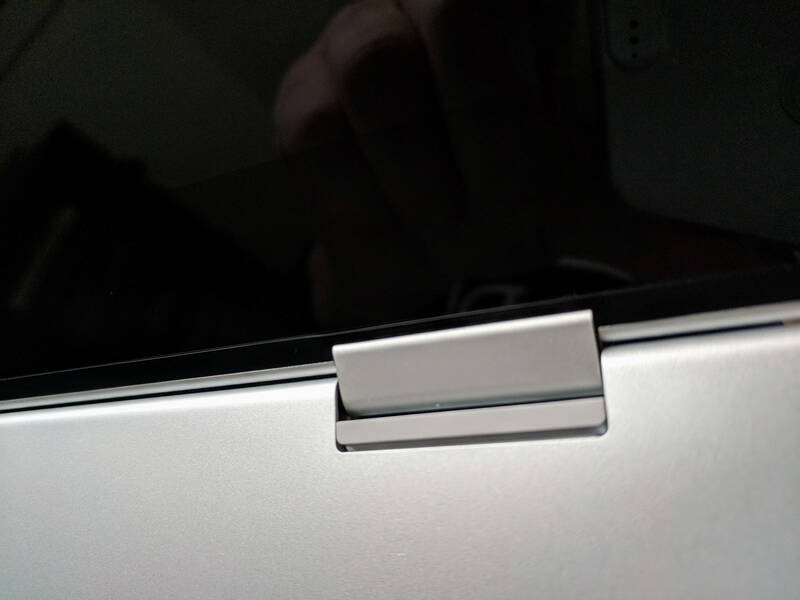 It butts up against the base of the keyboard, giving you a slightly larger area, which is nice if you are a tap-and-hold type user to move windows around on the display. The touchpad supports multi-touch gestures too. Google in the technical specs for the Pixelbook states that the device can get up to 10 hours of use from its 41Whr battery. That, I’ve found, is slightly optimistic. In reality, I averaged about 8 hours of life before I needed to plug in the 45W USB-C charger that comes with the Chromebook. Admittedly, I keep my screen pretty bright and even dimming it slightly made an appreciable difference in battery longevity. I normally keep the brightness at about 80% but if I drop it down to around 60%, I was able to gain nearly 45 more minutes of usage. So, like any other device, your mileage will vary based on your usage of the device. That stated, I’m overall pleased with the battery performance. When I am on-the-go, I tend to not shut the lid on my device regularly so I was able to easily get through a full work day and then some with no problem. When at home, I’m generally plugged into AC anyway so its a bit moot. 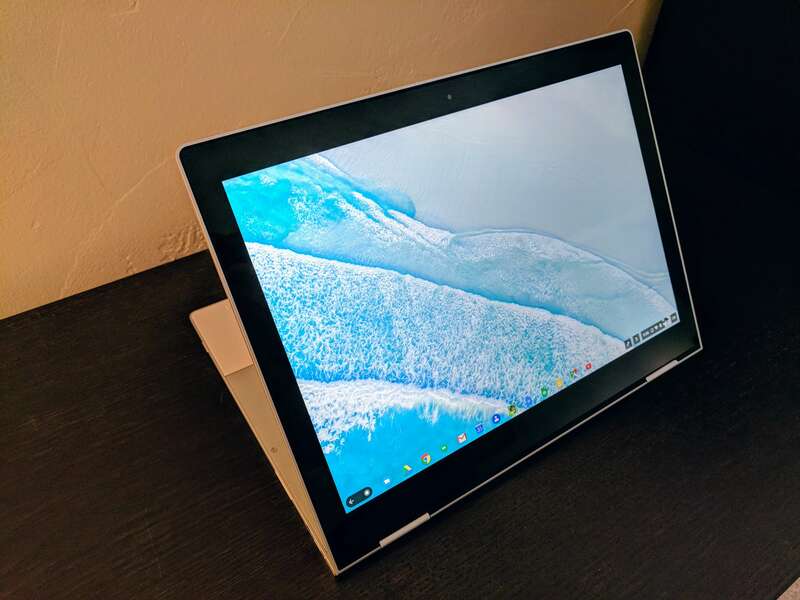 Google, however, did design the Pixelbook to fast charge so if you are in a pinch and low on power, you can get back up and going pretty darn quick. If you have at least 5% battery remaining and plug your Google Pixelbook into AC for 15 minutes, you’ll get about 2 more hours of usage. Plug in for an hour, get 7.5 hours back. That makes a huge difference for a lot of users. For me, it is in airports between flights that it worked out best for me. I could easily get enough battery back in the device to get through a second flight after 30-45 minutes of charging at the gate. Without a doubt, there are longer lasting batteries in other Chromebooks out there. The question is will roughly 8 hours make it for you? In my case, yes. It was easily enough to get me through the day without me keeping an eye on my battery consumption. I don’t think I’m special in this regard but rather average, thus it will likely meet the need for many of you too. The dual speakers built into the Google Pixelbook are probably the one area that you are going to have to compromise. They are okay, but not great. This is partly due to the slim size of the device itself. There is only so much room for speakers and they are not going to have the depth needed to produce a reasonable amount of bass. Thus, sound quality sounds a bit tinny. It isn’t horrible and it is certainly usable but you aren’t going to power a house party with it (that’s what your Google Home Max is for anyway, right?). For listening to music or the audio from a movie or YouTube channel, it will be just fine. Just don’t expect a lot powerful audio. That said, the audio performance from the 3.5mm headphone jack is excellent. Google doesn’t list the technology behind the scenes but tonal quality across the spectrum is great when you use headphone or earphones (of course, the quality also depends on the quality of your headphones). The Samsung Chromebook Plus and Chromebook Pro were the first clearly advertised devices that Android app support came on them out of the box. When the Google Pixelbook was announced, not only was Android support out of the box but the implied expectation was that it would be an awesome experience. The reality is, it is a good experience but not great. The issue here is not the Pixelbook and I want to quickly state that. When it comes to the actual running of Android apps, it is great. App response is snappy and the touch support through the touchscreen is accurate. The issue is Chrome OS itself. Since the release of the device, Chrome OS has had four major updates. In each update, support for Android app running has improved but it still isn’t an exceptional experience. That should be changing when we get to Chrome 64, which is currently rolling out and Chrome 65. Chrome 64 will bring the ability for Android apps to run in the background while Chrome 65 will bring split screen support for Android apps, with being able to resize those windows. Chrome 65 should be out in April 2018. If these two update bring what is promised, I firmly believe that Android app performance on the Pixelbook will be awesome. Taking a sidebar for a moment, this is exactly why a Chromebook is a great overall value for the long term. Regardless of if you by the Pixelbook or a $250 model, you will get updates for five years. Given that their are generally four to six major releases of Chrome OS each year, you are future proofing yourself nicely. When you compare to where Android app support was when it first rolled out to today, it is dramatic how much it has improved in a very short period of time. It is now a matter of refinement and that should be happening in the next couple of Chrome OS releases. That, in turn, will make the Pixelbook the top pick for running Android apps. 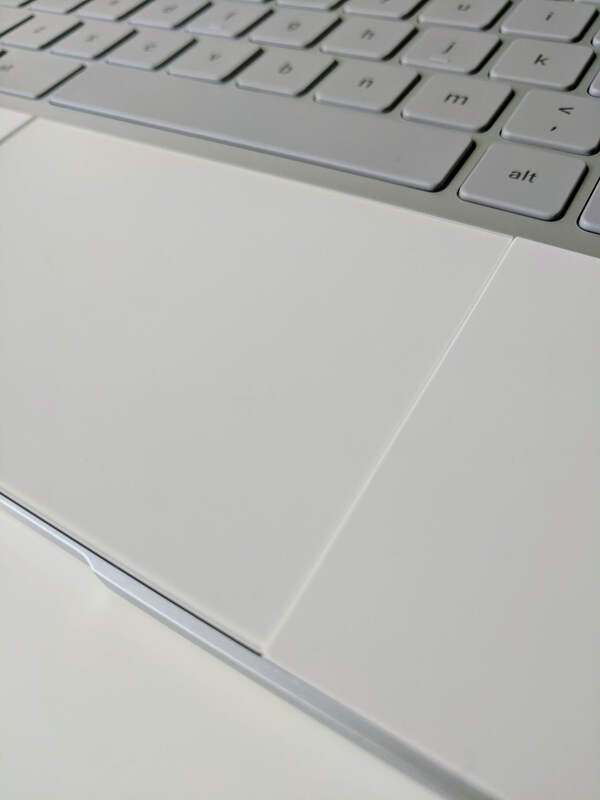 By using the button on the optional Pixelbook Pen. This changes the ink to a thick blue line and anything within the circle you have created will be sent to Google Assistant for analysis and to provide you information. Regardless of how you access Assistant, the performance is what you would expect and have grown use to having on your phone or Google Home. It just works. Having the Assistant button on the keyboard has been far more useful to me than I expected quite frankly and I tend to use it more than any of the other ways to access it. 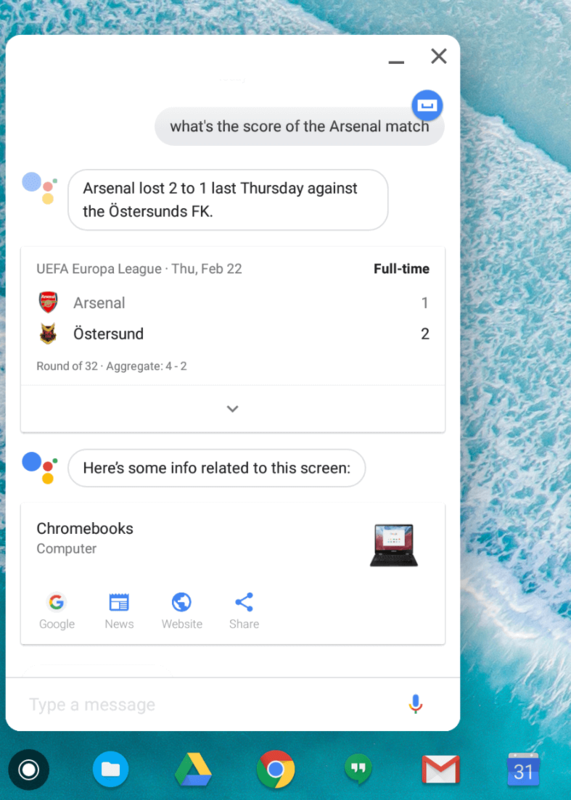 With Google Assistant integration, you can see where Google wants to go with it and Chrome OS. My disappointment with the Pixelbook Pen cannot be overstated. Don’t get me wrong, it works. It works very well and is amazingly accurate at drawing or inking something for Assistant to review. It has 2,048 pressure sensitivities so it will get the job done without any doubt from a pure stylus perspective. No, it is just the overall package and the hellishly expensive cost of it. First, the single biggest miss I think on the Pen is the AAAA battery. While it lasts a very long time, there is simply no reason to not make this rechargeable much like Huawei has done with their MatePen for PCs (which works with the Pixelbook by-the-by). It creates yet more battery waste that is beyond me why Google went this direction. So you pay $99 for the Pen and you get to feed it a $3 battery every six months or so (your mileage will vary)? Second is that price point. At $99 it is simply too expensive. If it were $50, I might feel differently. I suspect that the vast majority of those who have bought the Pen have used it a handful of times – maybe – and then it has just sat idle on their desk. That makes the cost per usage pretty high for most. The question of if you should buy it completely comes down to you. If you like to ink things up, draw and use the one-button on the Pen to send stuff to Google Assistant, I say go for it. You’ll love it. It’s highly responsive and there is virtually no lag in inking. But if that is not you, save yourself $100. You can access Assistant with you voice or the keyboard and be done with it. If there is one aspect of travel that grinds me it is having to pay for WiFi. I hate it, especially at an airport because it is always, without fail, painfully slow. O’Hare, I’m looking at you. For that reason, I often tether my Google Pixel to my laptop but, as those who tether know, you have to go through a bit of a process to get things going. If you feel my pain on this then let me tell you how wonderfully fantastic the Instant Tethering feature is on the Pixelbook. It is glorious and such a massive time saver when you only have a few minutes between flights to get that last email out. Instant Tethering is not something that is enabled by default as the feature has to learn your phone. This is actually a pretty easy process to enable and once you have it setup with your phone, it will turn on automatically when you do not have a WiFi connection available. Obviously your connectivity speed will vary depending on your network conditions. 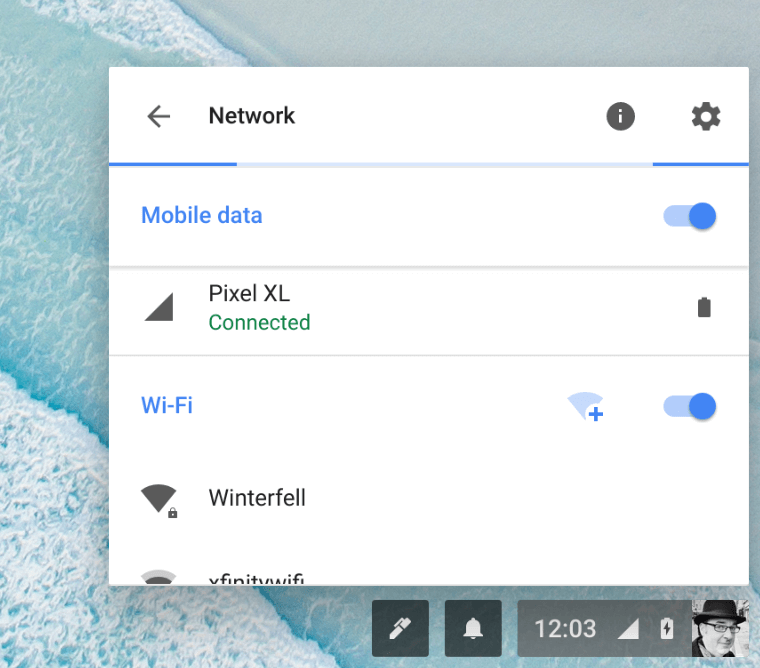 Instant Tethering is rolling out to other Chromebooks but it does require that you have a Google Pixel phone (first gen or second gen). 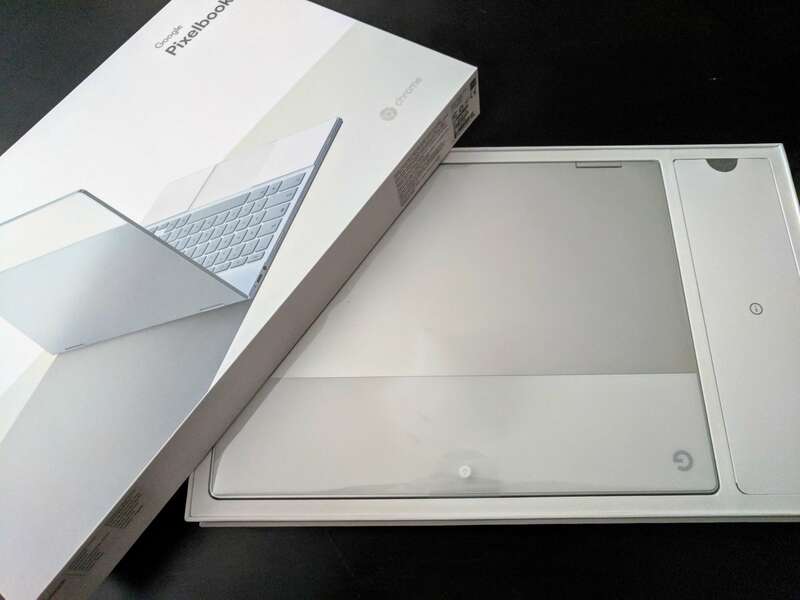 Google is quick to point out that the Google Pixelbook is a “4-in-1″ device, meaning that it can be put into four different physical configurations to maximize whatever you are doing at the moment. The question to be asked is if these different modalities are useful or physically difficult to use. In my using of the Google Pixelbook, three of the four are solid and really makes this device work in any situation more-or-less. The most obvious mode is in laptop mode when I’m not going to spend any time on. The second is tent where you have the screen rotated back to form a tent (upside down V) with the device. This is great for watching videos, especially on a soft surface like a bed or sofa. It is also handy for when you are inking something on the screen. Third we have View which is where you have the screen rotated backwards so that the keyboard is facing down on the table. Think of it as a backwards laptop mode to a degree. This mode is great for viewing videos or other content, drawing and inking, and for some game playing. This mode is excellent for viewing content while the Pixelbook sits in your lap. Finally there is tablet mode where you have the device folded back onto itself to form a 12.3” display tablet. The only mode I found unorthodox or cumbersome was the tablet mode. The device is just a bit to big and a bit too heavy to really be used like this unless you are reclining on the sofa and have the Pixelbook in your lap. But if you have to hold the 2.4 lb device in front of you, it gets pretty heavy pretty fast. I tried to play Real Racing 3 on the Pixelbook while it was in tablet mode and while the game play was awesome, tilting the device left and right to steer was quite a workout after a few minutes. Just keep this in mind if you are sold on replacing your Android tablet or iPad with the Pixelbook. It’ll do the job but it is a bit heavy for that type of viewing/activity. Otherwise, having these different viewing options was great. I liked being able to put the Google Pixelbook in tent mode to view videos while I was on a plane (or in View mode in my lap if I was in a particularly cramped economy seat. United, I’m looking at you). I particularly found using tent mode while I was binge watch something on Netflix while I was in bed handy. So let’s get to the question of the day after you’ve read this review: Is the Google Pixelbook worth its $999 price tag? The answer is yes. You will not find another Chromebook out there right now that can run Chrome OS and Android apps as efficiently. Both platforms fly on this device and I’m using the base model. I can’t imagine what the i7 model’s performance is on running things. 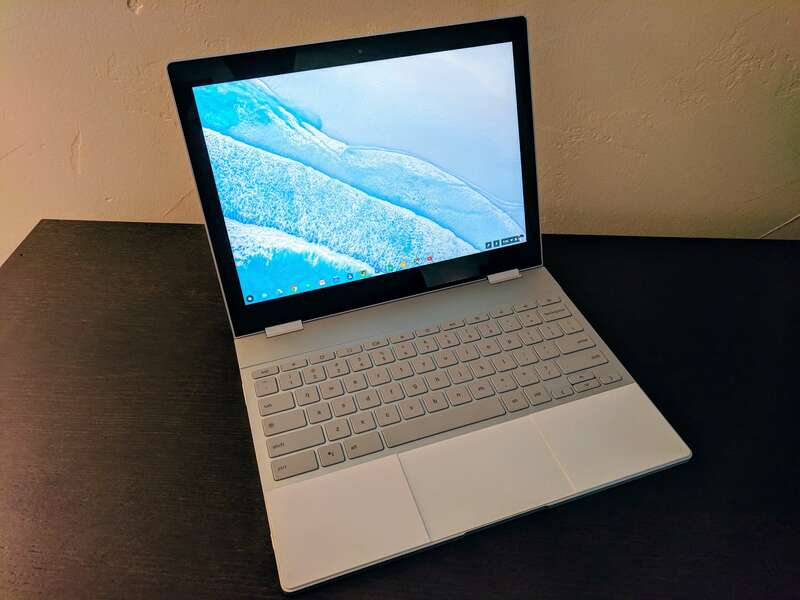 As I opened up this review, the Google Pixelbook isn’t perfect. I think the improvements coming in Chrome 64, 65 and 66 for Chrome OS will make a big improvement in how Android apps run on the device but that’s not the physical devices issue. That’s simply the maturity of the platform on which it runs. I’d also say that it would be nice in the next generation to have a better audio performance experience out of the built-in speakers but frankly, that’s probably being a bit nit-picky on my part. I highly recommend not getting the Pixelbook Pen, at least not initially. I honestly believe it is overrated and hellishly expensive. Plus, I’m not a fan of it using a non-rechargeable battery. 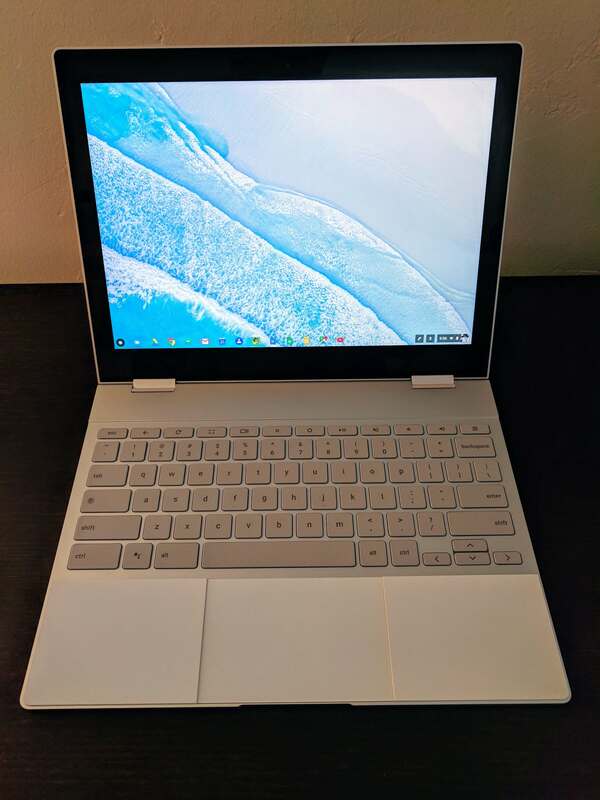 My advice is to get your Pixelbook and use it a few weeks to see if you really need the Pen. My bet is, the majority of you won’t. 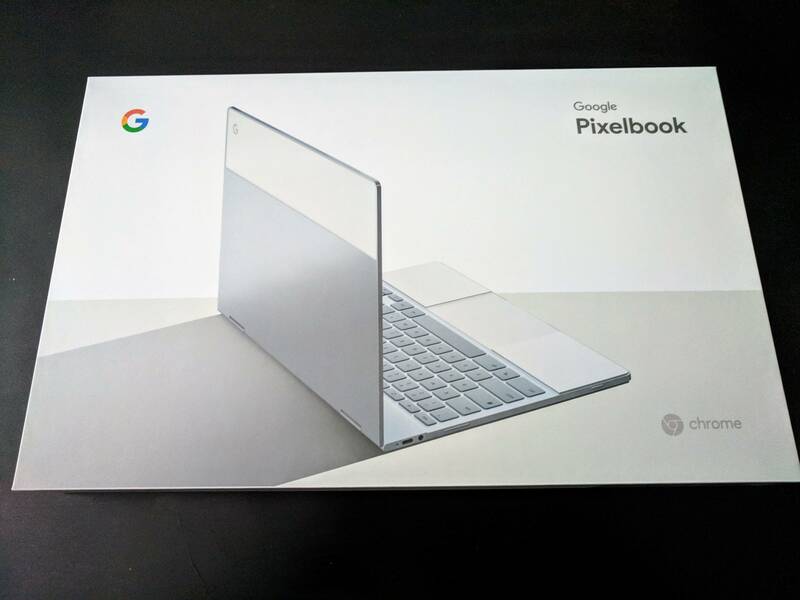 The Google Pixelbook is available through a wide range of retailers including Amazon, Best Buy, and the Google Store. At the time of this post, the base model that was reviewed here was $899 at all retailers and will remain at that price through March 3, 2018. Nice writeup, I’ve been considering picking one of these for a few months. I agree it’s a beautiful device but, for me, those bezels are a spoiler. I’ve heard the argument about needing them to use it in tablet mode but, to me, they make the device seem ‘dated’. I guess Pens are not a popular input method – even Surface devices don’t include them in the box any more. But I’m glad it’s an option, I use pen input daily, so I’d like to test it. Ultimately though it’s the price holding me back. For me this can’t be my primary PC, which makes $999 just too much for a secondary device. Thanks for the comments Anthony. I agree that I’d prefer that the bezels be a bit smaller but honestly, it isn’t much of a distraction for me. 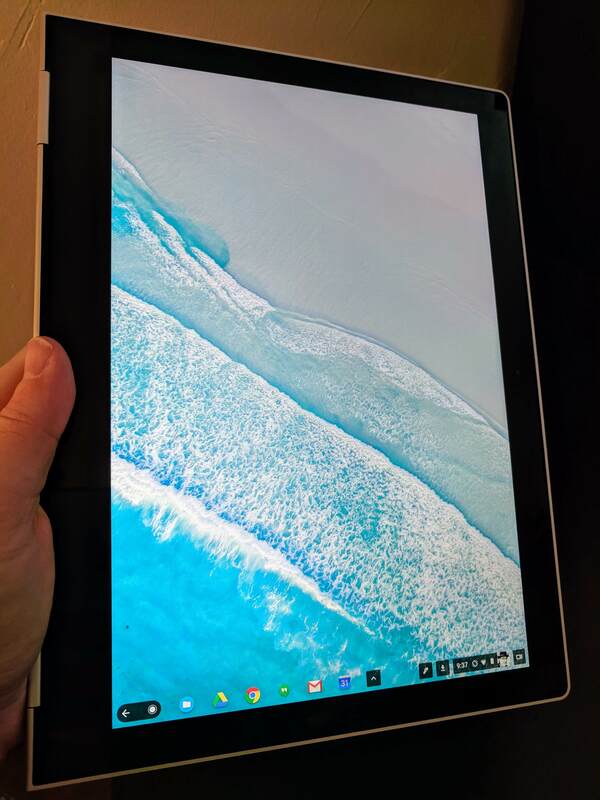 I have heard the tablet argument too but others are getting away with smaller bezels (ASUS C302) so I’m not sure I buy it. But for me, the overall power and performance of the device and the display is enough for me to “see around” the bezels.